To finish off my look, I grabbed my latest favorite backpack from British brand Beara Beara (from whom you can get 15% off using my discount code “camilleco15″). 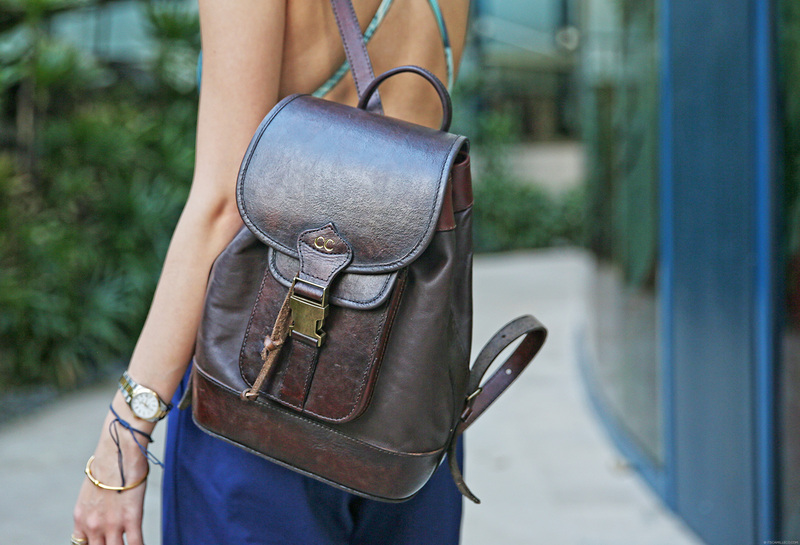 This beautiful backpack is not only hand-made genuine leather but is also customized with my initials. (Again, more awesome. Awesome is apparently today’s favorite word.) The result? Summer-ready, fuss-free and still fashionable! P.S. Although we’re already experiencing summer on this side of the world, spring is just about to hit the other side–which means it’s time for Shopbop’s Spring Sale once again! (I just had to share this good news with you! From today until 11:59PM Pacific Time on March 5, get 15% off on orders above $250, 20% off on orders above $500 and 25% off on orders above $1000. More details here. You’re welcome. Wearing airy culottes over a swimsuit is definitely a very clever way to stay cool and stylish <3 And yay for multi-way swimsuits! They're the best! Eight mermaid swimsuit! I’m a huge fan of their designs and what I like about the one you’re wearing is that you can style and change up the string details at the back. I love how you styled this one Cams. So ready to hit the beach! Yeah super versatile too! :) Thanks Anne! Eight mermaid swimsuits are rocking!